So we all know that Epsom salts carry many miraculous qualities, particularly when it comes to bathing and skincare. They draw out toxins and purge impurities from our skin, and are even thought to help decrease our stress levels when used in a nice, hot bath. But the benefits of Epsom salts aren’t confined to the bathtub – Epsom salts are useful in the garden and do wonders for not only humans, but for plants as well. Epsom salts are becoming more and more popular in organic gardening, due to its natural benefits (no chemicals needed!). Epsom salt is “green” way to make your garden flourish, and it’s inexpensive to boot. No wonder it’s the new gardener’s “secret” weapon. 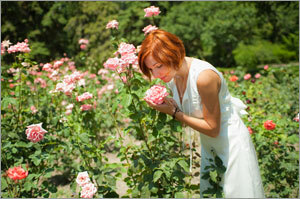 Throughout the ages, Epsom salt has been used to cultivate healthy, lush plants and flowers. When mixed with regular soil, Epsom salt can help seeds germinate, increase chlorophyll production, and improve nitrogen and phosphorous intake. 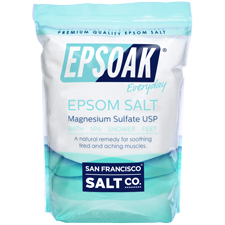 Epsom salt is also known as magnesium sulfate, because each grain of Epsom salt contains sulfur and magnesium. Research has shown both of these nutrients to be essential in the life of a healthy plant. Sulfate aids in the production of chlorophyll, which not only gives plants their green color but also aids in photosynthesis, the process plants go through when they transform sunlight into nutrients and sustenance. Sulfate helps plants absorb and utilize key nutrients such as potassium, phosphorous and nitrogen. Magnesium plays a large role in any plant’s life, beginning when it is just a tiny seed. Magnesium actually fortifies the walls of every cell within the plant, so that the plant can fully absorb other important nutrients. Magnesium, like sulfate, is a key player in chlorophyll production and also aids in the process of photosynthesis. The magnesium found in Epsom salt promotes phosphorous and nitrogen intake as well, making the soil around the plant more fertile and rich. Together, magnesium and sulfate are quite the powerful pair, creating an environment full of nourishing minerals and nutrients for your plants, resulting in a fuller, more vibrant garden. What does this mean for your garden? When you add Epsom salts, your plants will be fuller, more vibrant and green, and flowering plants will produce more blossoms. Thanks to Epsom salts, you can have the garden of your dreams, filled with gorgeous, healthy plants and trees – even if you don’t have a green thumb.